The walk had been made before—16 days shy of a year ago. Then and now, the prayers were the same: May the dead find peace… May those who loved them find peace.,, May the whole world be happy. But although the walk Amma led from Amritapuri to Azhikkal today seemed in many ways a flashback to the one immediately following the tsunami, in others it was entirely different, as the road itself was different. 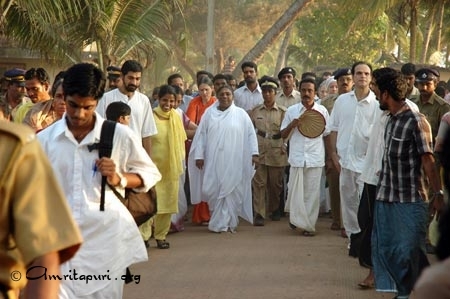 And, of course, the other major difference was that when Amma made the walk to the Azhikkal cremation grounds today, she passed by the hundreds of new houses—more than 1,000 built by the Ashram so far—that now line the road or are partially visible from behind groves of coconut trees. 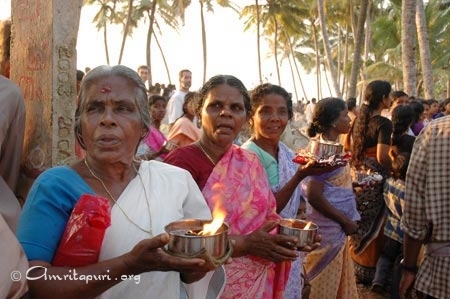 Unlike a year ago, when Amma began the two and half-kilometre walk today, the road was lined with 10,000 people—a mix of residents of Alappad Panchayat, Ashramites and Amma’s devotees from around the world—all holding small clay oil lamps in their hands. Smriti deepam–lamps of remembrance. When Amma reached the cremation grounds, she blessed with flowers a newly installed statue of a woman’s head and open hands. Made of black sand, the woman symbolizes the land praying to the sea to maintain its boundaries. It was here that two days after the tsunami 42 bodies had been burned: mothers, fathers, dozens of children. Today, their photographs, draped with garlands, rested near the individual pyre sites. 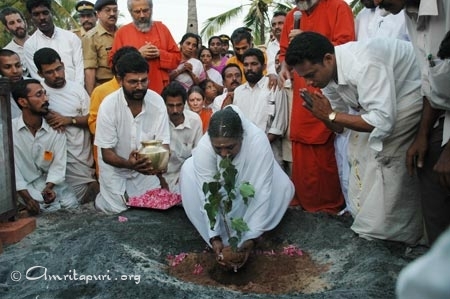 In their midst, Amma planted a small peepal tree and then led all those who’d accompanied her in circumambulating the cremation grounds. Amma then sat down on the sands of the cremation grounds and asked everyone to chant Om lokaha samastah sukhino bhavantu. 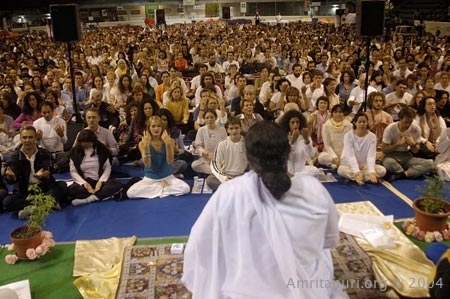 The sound of all the 10,000 people chanting the mantra filled the air for the next five minutes. The only other sound was that of a few women, who had lost members of their family, breaking down. 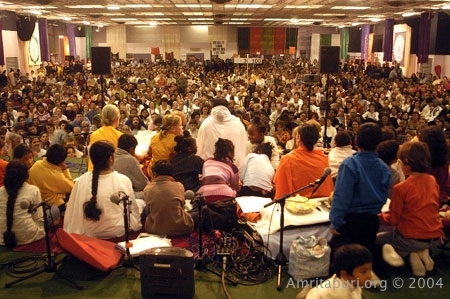 Addressing the villagers and devotees, Amma compared life to music that can be beautiful and harmonious if lived correctly, or full of chaos and destruction if lived carelessly. She encouraged everyone to spread the light of kindness, saying that its flame never diminishes with sharing but rather intensifies. A year had passed since the tsunami. It was a time to remember the dead. But perhaps more importantly it was a time to remember life and how to live it so that even death cannot touch us. 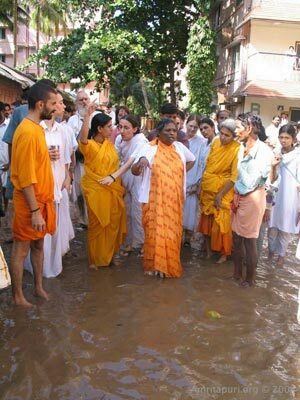 Amma giving directions to brahmacharis for the relief and rescue operations. I was on the Internet and saw the news that giant waves were hitting Chennai and flooding the city. I ran up the stairs to the temple where Amma was giving darshan in order to inform Her. Amma was very sad to hear the news. I soon came back down and started looking for more information on the Net. 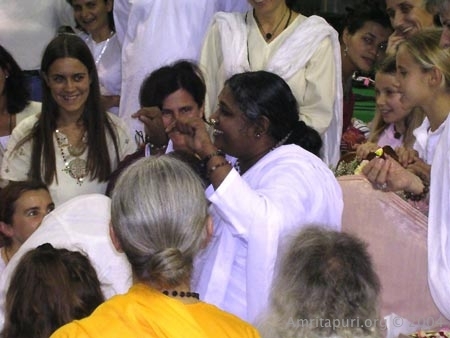 Then someone came in and told everyone in the computer room that the sea had risen up and was starting to flow into the Ashram grounds near Amma’s hut. Amma immediately asked me to make an announcement over the sound system, asking all the devotees to move to the top floors of the flats. She then told all the brahmacharis to move everything from off the ground floor. 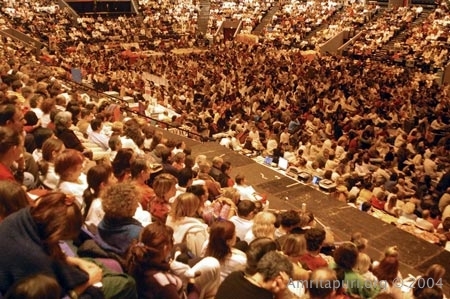 The announcement was translated into many different languages—English, Hindi, Marathi, Tamil, Kannada, etc.—as there were 13,000 people in the Ashram at the time, including 1,000 from outside India. 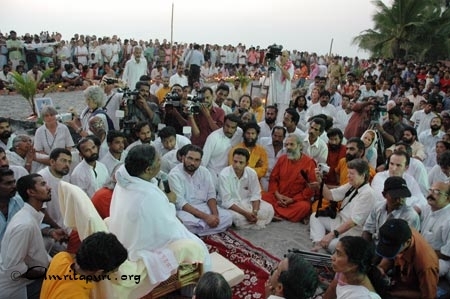 Amma then asked that all the vehicles parked in the Ashram lot near the beach be moved off the peninsula, as one of the devotees cars had been pushed back several feet when the water had come. At Amma’s request, I also went to ask all the devotees who’d gone to the seaside ayurveda building to come back. I grabbed my small digital camera—which also takes video—and started running to the shore. I admit, I was very curious as to what I would see there. 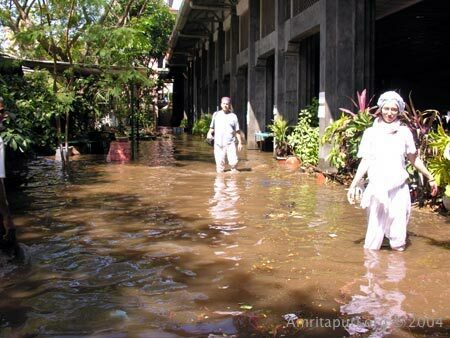 When I reached, I saw that the sea had already withdrawn, but a small amount of water had swept through the ground floor of the Ayurveda building. The brahmacharis who worked there were busy moving everything upstairs. I looked out at the sea. It was quite calm. Actually, it had even drawn back 40 feet, exposing brilliant white sand. It looked quite beautiful. I took some pictures of the sea and beach, walking out on the sand itself. Then the sea slowly started coming back. After a couple minutes, some of the villagers who were standing on the sea wall began shouting and pointing down the coast. They were telling people to run, that the sea was violently coming up against the rocks to the south. I ran into the Ashram ayurveda building and headed up to the roof. The sea indeed was rising fast. It came up to the sea wall and then spilled over. I was excited. I started shooting video with my little camera. Again the water receded. Then a few minutes later, the sea rose up a third time. 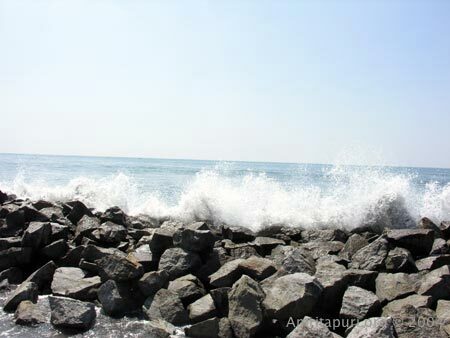 This time, it surged forward onto the beach and poured over the sea wall with real force. It did not come as a wave, but as if some invisible dam that had always been containing it had suddenly been removed. 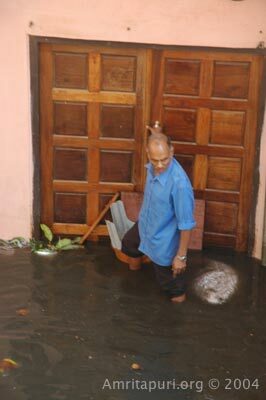 The water rushed towards the ayurveda building, bending the trunks of the young coconut trees planted in the compound. I had seen so many situations like this one depicted on National Geographic, but this was the first time I was seeing something like that right in front of my eyes. 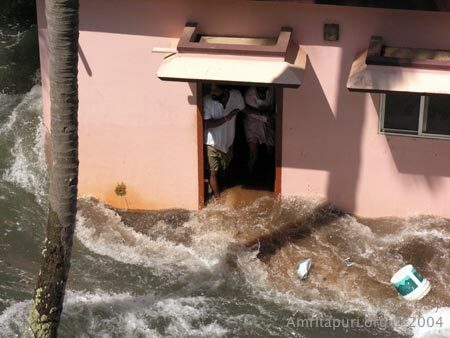 The water smashed into the ayurveda building and simply kept going, flowing like a river. 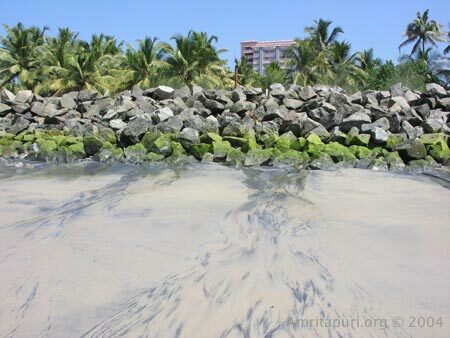 All of the ayurveda compound and the Beach Road beyond it looked like it had been overtaken by white-water rapids. Even though I know how to swim, I knew very well that because of my health problems that if I were caught in the flood that I would not survive. 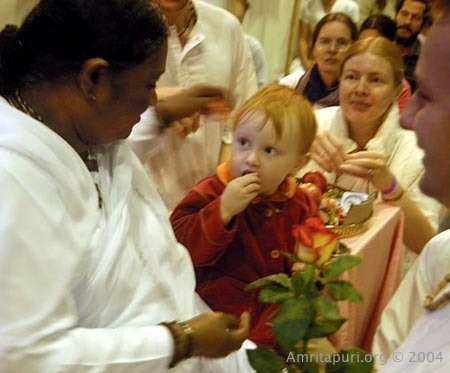 Still, I was not afraid; I knew Amma’s grace was protecting me. There is a second smaller building in the ayurveda compound, which is used for storage. I saw that three brahmacharis were trapped in there, one of whom I knew couldn’t swim. I was worried what would happen to them. The water was really rushing past that building and it was quite deep. Suddenly, the cement wall around the ayurveda compound washed away. Everything was chaos and confusion. Huts and houses were being washed away. Power lines were down. The air was filled with the sound of men shouting, women screaming. I was helpless. Continuing to video with my small camera, I prayed to Amma to save everyone. Across the Beach Road people were climbing up onto the roofs of their houses. Others were wading quickly through the waters, struggling to get to their near and dear ones in order to save them. After 15 minutes or so, the current of the water began to somewhat subside. I quickly waded through the water in order to get to the Ashram. 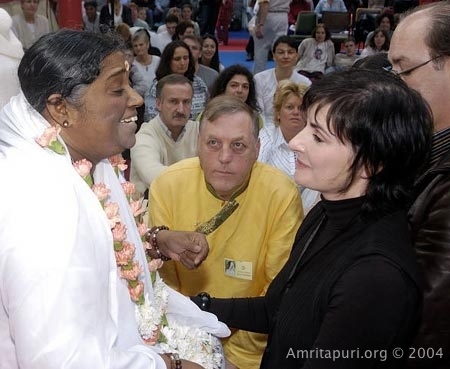 When I arrived, I saw that Amma had stopped giving darshan. 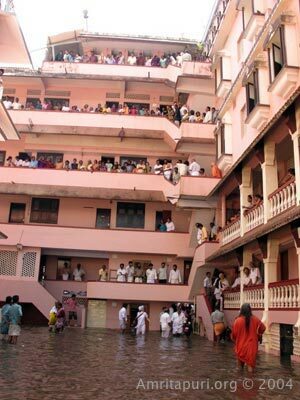 She was standing on the balcony of the temple, yelling at any devotees still standing in the water to come upstairs. The next thing I knew, Amma had wrapped a yellow sheet around Herself and was descending the spiral stairs from the temple into the water, which was about three-feet deep. It was such a surreal scene. 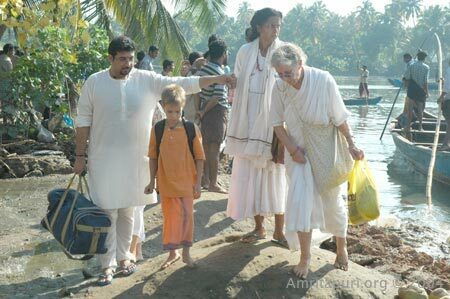 One brahmachari was pulling a small row boat to the staircase where Amma was standing. He wanted to take Amma to safety. But of course She wouldn’t go without Her children. 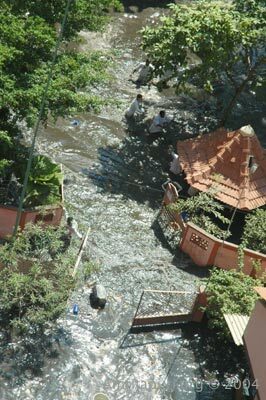 Amma then called a few local people and asked them if it was possible to arrange for extra boats to help people cross the backwaters. Some of the young village boys agreed. Within a few minutes they returned with extra boats. 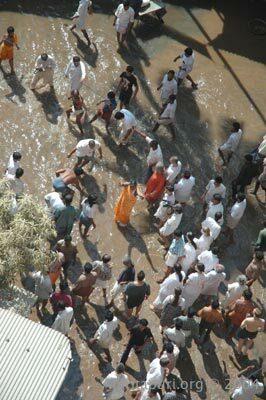 Amma then waded through the water to the boat jetty. She began calculating how feasible it was to send everyone across at this dangerous time. The water had abated, but more could have come at any moment. 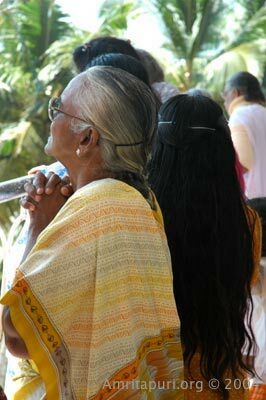 She spoke to the boatmen and the villagers and the senior ashramites. She then had a safety-line strung all the way from the temple to the jetty. 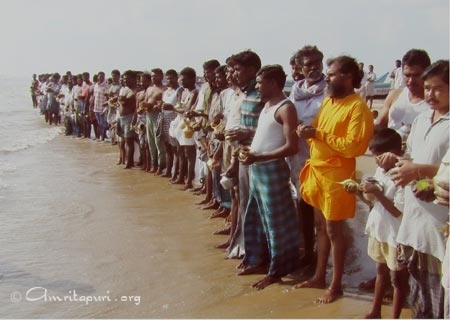 Having made Her decision to relocate everyone to the mainland, Amma started sending people across. 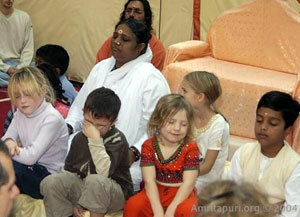 First, She sent the villagers who had taken refuge in the Ashram building, then the devotees and last the ashramites. When sending the villagers, Amma would enquire if they had all the members of their family with them or not, before sending them across. She didn’t want anyone lost or left behind. After ten or fifteen minutes, She call a brahmachari and says “Go to the other side. Buy milk, tea and sugar, prepare chai for them. Go”. When the foreigners came past Her, She would ask them if they had their passports or not. She then told the people running the International Office to gather all the important documents. 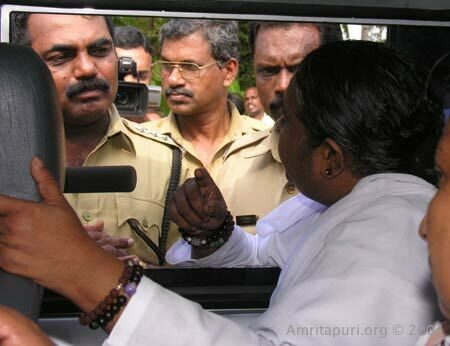 The amount of detail Amma was paying attention to was amazing—this was really disaster management! 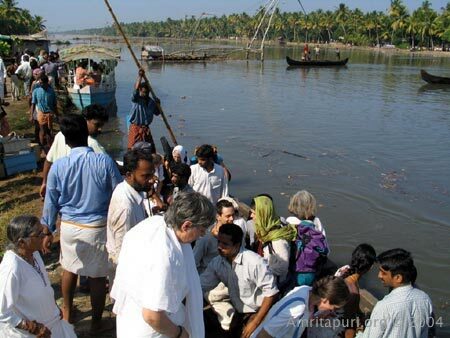 By this time, I was running back and forth, making sure everyone had crossed the backwaters, that the boats were running properly and that the volunteers were following Amma’s orders, and then reporting back to Amma. 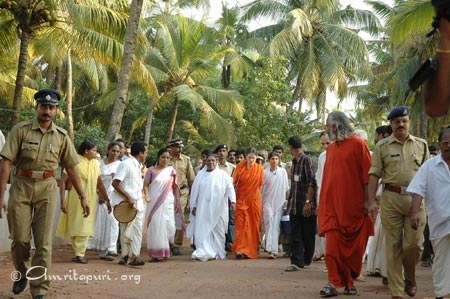 The next order of business was ensuring the safety of the Ashram elephants and the cows. 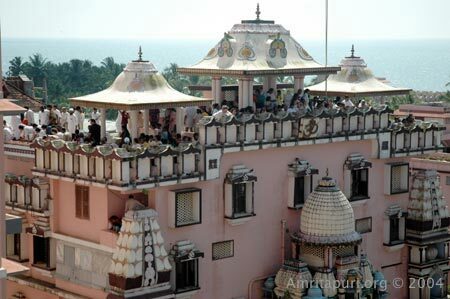 Amma said that they should be accommodated in the main temple. It was really funny to see Ram and Lakshmi climbing up the temple steps, followed by all the cows. 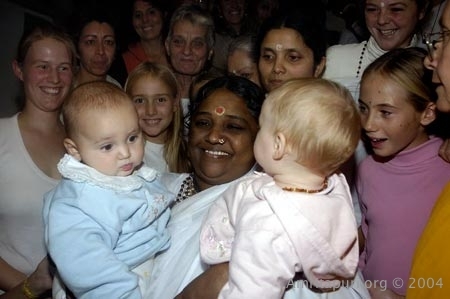 Amma had some brahmacharis bring hay and water for them. Soon it looked more like a zoo than a temple. A few hours later they were taken across the backwaters on foot via the Beach Road Bridge. Then sun was setting and still Amma Herself had not crossed over. She wanted to be sure that the whole village had made it to the safety of the mainland before She left. 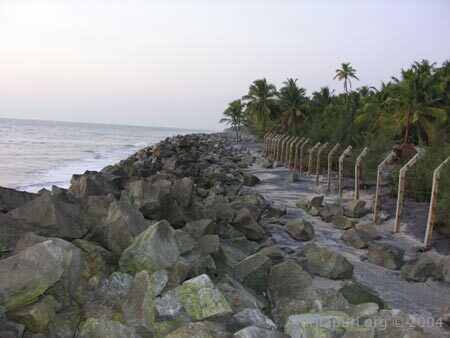 Allappad Village, of which the Ashram is apart, is only 50 to 100 metres wide, being a peninsula between the Kayamkulam Backwaters and the Arabian Sea. But it is about four kilometres long. Amma had boats sent to other parts of the village to take everyone across. She was really concerned. 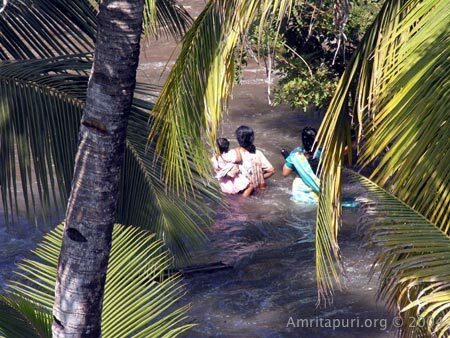 Amma told me that She was happy that Her disciples were running around to help rescue the villagers and devotees. In their selflessness, they had forgotten that they also had to save their own lives. 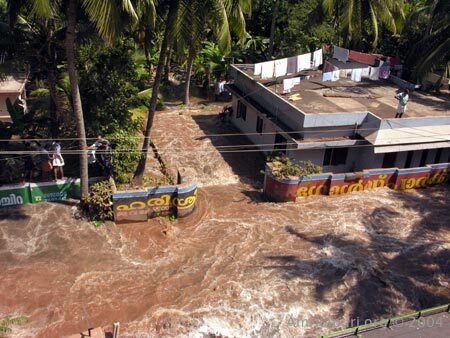 It seems that when the water had just started coming in that the brahmachari in charge of Ashram electricity had immediately switched off the main power, pulled out the UPS cables and called the electric department and told them to switch off the mainline. He had done this all on his own. It was getting really late. People were expecting another surge to come at any time. 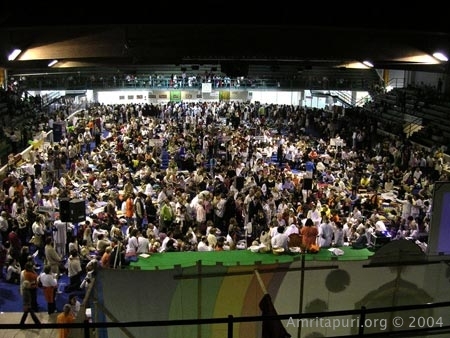 Amma evaluated what could be brought from the Ashram to the university campus across the backwaters to help the evacuees—things like food, sleeping mats, clothing. She then inquired into what all was available at the university in terms of cooking supplies and sent brahmacharis to purchase whatever else was needed. 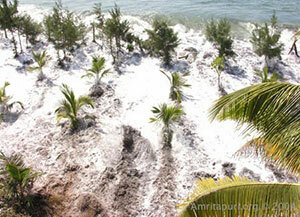 Most of the 10,000 straw mats owned by the Ashram were stored on the ground floor and thus were soaked with salt water. 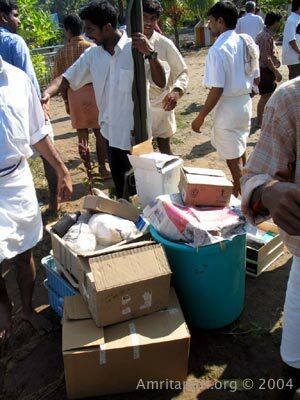 Amma had the dry ones packed up and taken across for use at relief centres. Similarly, the bottom level of our piles of rice sacks had been soaked in the flood. What remained dry was taken for use in the relief work. 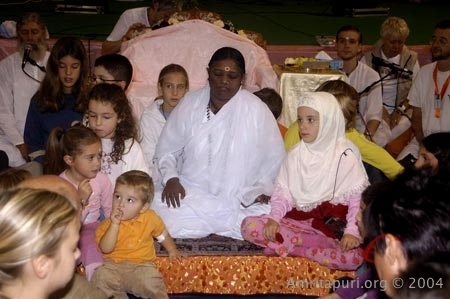 Eventually Amma realised that some of the disciples would not leave the Ashram because Amma had not left. The ashramites love Amma more than their own lives. They could not leave Her in the current situation. Amma knew this. But She also knew that their families would not understand if something happened to them. It could even have brought a bad name to Sanatana Dharma. 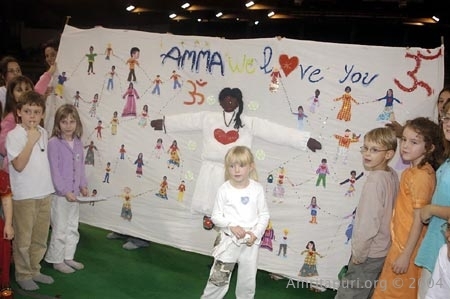 So eventually—after midnight—Amma decided to go across Herself with the 20 or so people who had remained. On the other side, She continued coordinating relief works. She called Shaaji, a local fire officer, and asked him if all the people at the relief camps set up by the government had been served dinner. When She came to understand that there was not enough food, She told the brahmachari in charge of the Ashram kitchen to start cooking. All the 75-kg sacks of rice that had not been soaked by sea water had been brought over for cooking and distribution at the relief camps. Some of the evacuees at the relief camps said they did not need food that first night, as some other organisation had provided it, but that they wanted breakfast the next morning. So Amma told them to start cooking uppama for the next morning. The kitchen was soon preparing more 1,700 to 2,000 kg of rice a day, as well as 1,000 kg of uppama. We also gave away 1,500 litres of milk each day. 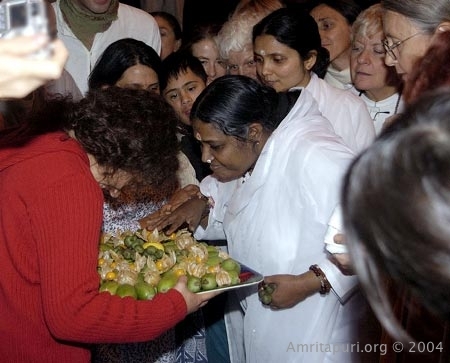 Amma also said that no one from outside the Ashram should be allowed in the kitchen, as She was concerned that someone may intentionally contaminate the food and cause everyone to get sick. 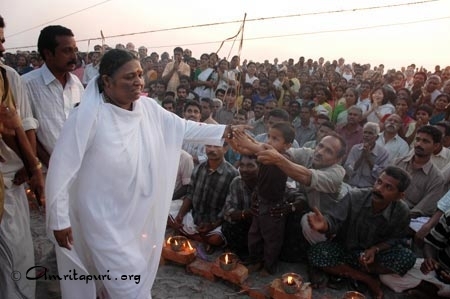 Amma then put five brahmacharis in charge of looking after each of the 12 relief camps set up by the government. 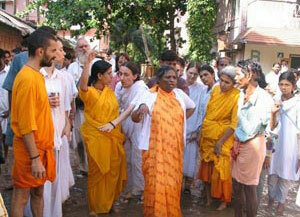 She also assembled teams of devotees to accompany them. She wanted the relief camps to be amply provided for, but She was very concerned that not a grain of rice be wasted. Amma called seven ambulances from AIMS, as well as medical teams, headed by 10 doctors, with paramedical assistants and nurses in order to start providing medical care for the evacuees. Within the first 48 hours, the doctors had distributed medicine worth four lakhs [Rs. 400,000] and seen more than 1,700 patients. They were making rounds so that each camp would be visited every two hours. Some of the evacuees were heart patients or had high blood pressure or diabetes. Their medicines had been lost in the flood. One evacuee named Shantakumari even started vomiting blood because she had missed taking her medicines. Some of the volunteers, like Vivek from Japan, even learned a few sentences in Malayalam so as to be of better service in the relief work. 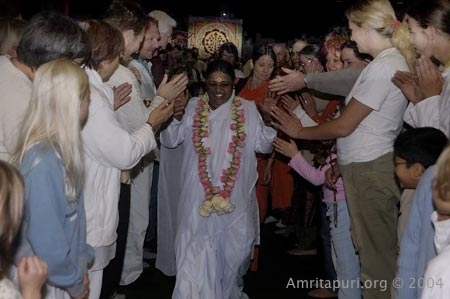 “Asukham undo?” [“Are you unwell?”], he would ask the people when he went out with the Ashram doctors in the ambulances. He then would bring those who said yes to the doctors. Even though most of Amma’s children from outside Kerala do not know Malayalam, they transcended that language barrier, communicating on the level of love and compassion that Amma is always teaching. Around 13,000 people were accommodated at the Amrita University Engineering College and at the Amrita Ayurveda College—that includes ashramites, visiting devotees and villagers. They all shared the same roof, food and facilities. 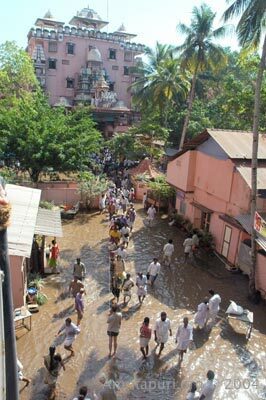 Most of the visiting devotees returned to their homes the next day. Since the government had filled up all their schools, people were sent to the temple in Ochira. But there was nothing there in terms of amenities. The people were just lying on the bare ground. Amma sent six buses there to take people to Amrita Vidyalayam at Puthiyakavu, but the people refused, preferring to stay in that holy place. The sun came up, and Amma still had not eaten or slept. 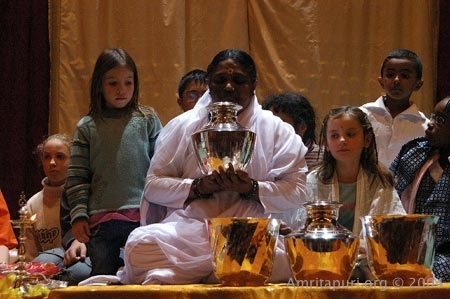 Once when offered a glass of water, She said, “How can I drink when so many people have lost their lives?” Around 9:00 a.m. Amma visited two relief camps set up by the Ashram. She did not inform anyone that She was going. She just started walking towards the Engineering College with bare feet. The college is about a furlong to the east from the AICT building where Amma was staying. The brahmacharis ran to find a vehicle and driver to take Amma. But by the time the car came, Amma had already walked half the distance. At the relief camp, Amma went around, asking the people how they were. 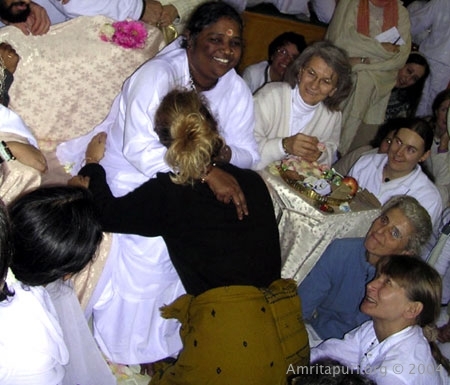 When Amma saw someone with a wound or a cut, or a bandage, She would ask them what had happened. Were they in pain? Did they have medicine? Were all their family members accounted for? Were their neighbours ok? 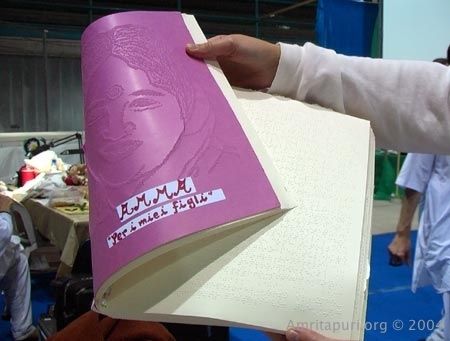 It was unimaginable the number of details Amma was going into. 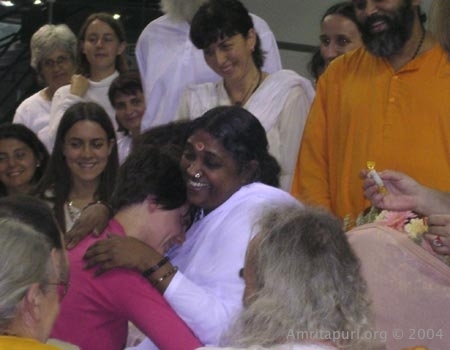 Eventually, Amma met a man who had lost his son. The whole family was there: the wife who had lost her husband, the children who had lost their father. 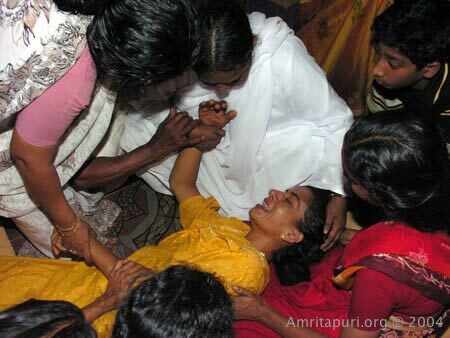 They told Amma how the man had been running to save his mother. She had a gimp leg and was suffering from depression. On his way, a wall had fallen on him. At least the mother had been saved by one of the brahmacharis. For 10 minutes, Amma simply cried with them. She just sat there wiping the tears of the mother, the wife, the father, the children, as well as Her own. 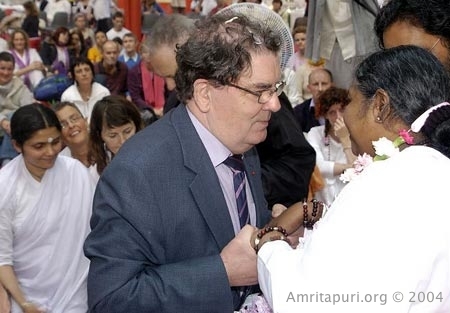 The tears flowed ceaselessly from Amma’s face. 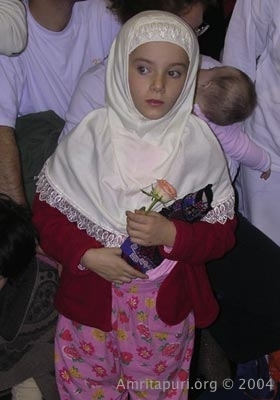 The grief of the entire family was reflected in Her eyes. 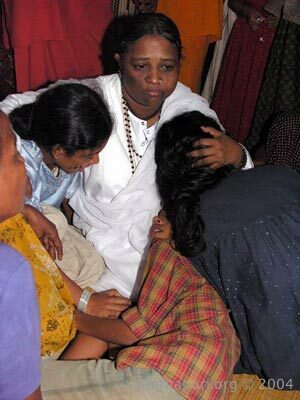 At one point, Amma had the children on Her lap, the wife in Her arms, and the father was holding Amma from behind, laying across Her back, as it were. She consoled them and encouraged the young boy, telling him that he had to be strong so he could be the support for his family. “Don’t worry. 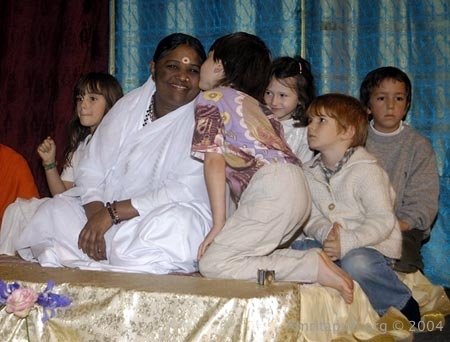 Amma is there with you,” She told him. The wife eventually seemed to have cried herself out. 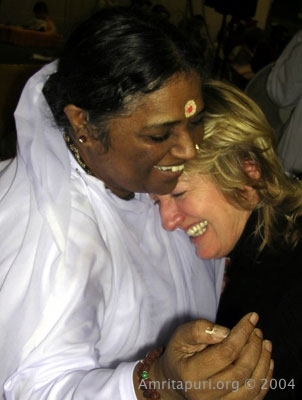 She then fell into Amma’s arms like a wilted plant. 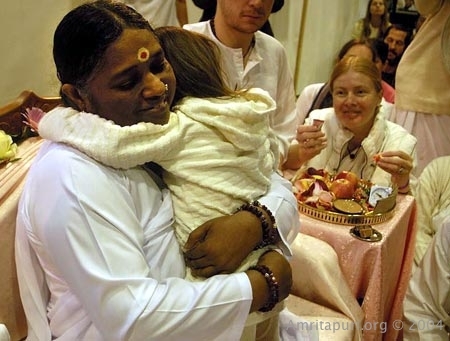 Amma silently held her like that as she gasped for air, like a child who cannot calm down after crying. Filming this, I realized that I also was crying. Tears were running down both my cheeks. The whole 20 minutes Amma spent with them, I was in tears. 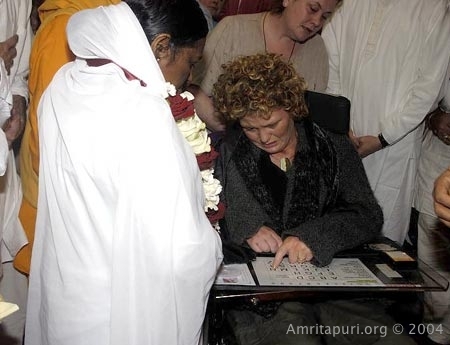 Amma then went to the Ayurveda College, where all the injured and sick were housed. 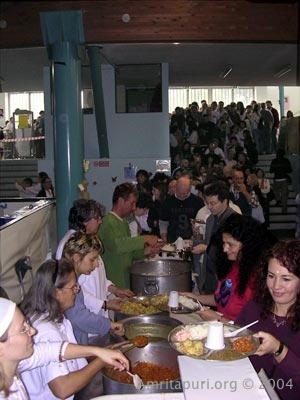 Many people were there suffering from small injuries, disease and mental shock. 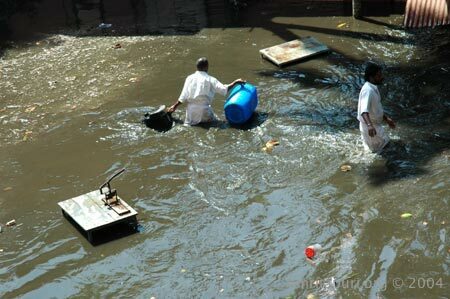 There was a man there who had been rescued by brahmacharis and brought across the backwaters. Another patient was Bhargavan. Back when Amma held Devi Bhava darshan in the kalari, he was the one who would blow the conch with one hand and ring the temple bell with the other. He had some minor injuries. 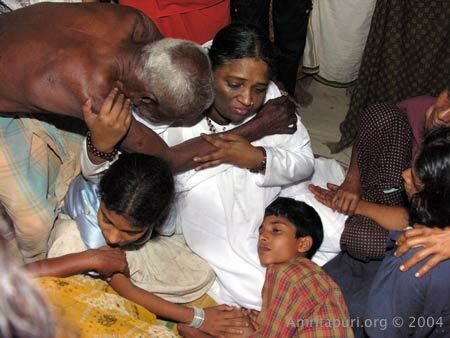 He told Amma that he had been praying that She would come and see him. 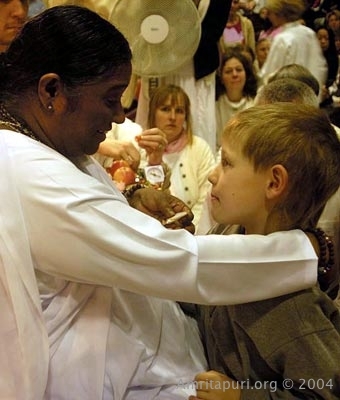 Amma bent down and kissed him on the forehead. 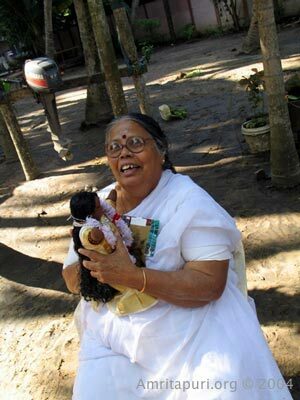 From where he was laying on the bed, he lifted up his arm and wrapped it around Amma’s neck. There was also a lady there who had lost her child. She was in a terrible shock—not speaking or taking food. Just sitting, staring out with blank look on her face. 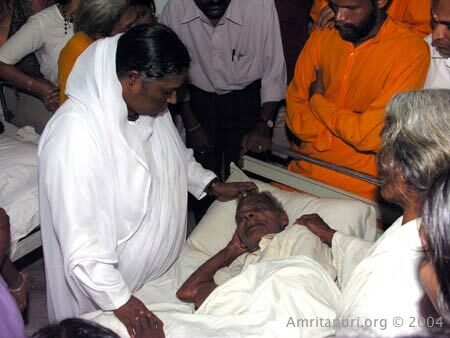 Amma made her lie down and asked the doctors if they could give her some medicine to help her sleep. She also told the brahmacharinis to watch over the lady’s surviving two-year-old baby. 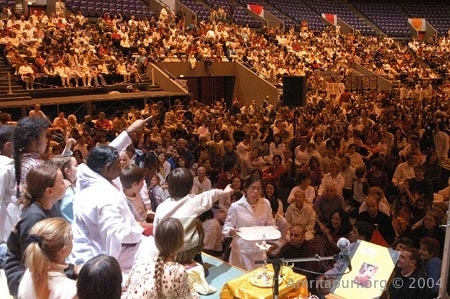 Many of the evacuees were Amma’s devotees. As Amma walked amongst them, She said that many of them didn’t even know that they had lost their children or relatives yet. Some had died from being knocked unconscious and then drowning in the water—others, when a tree or a piece of a house hit them on the head. 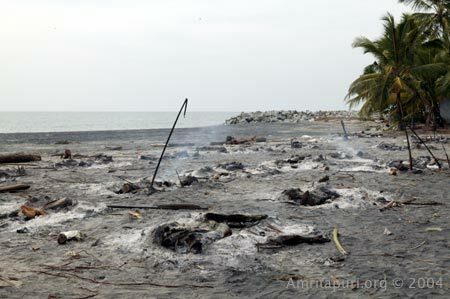 We had already collected four dead bodies from the Ashram jetty. In the next 24 hours, we helped recover 12 more. Once, a mother was found on one side of the river and the body of her child on the other. 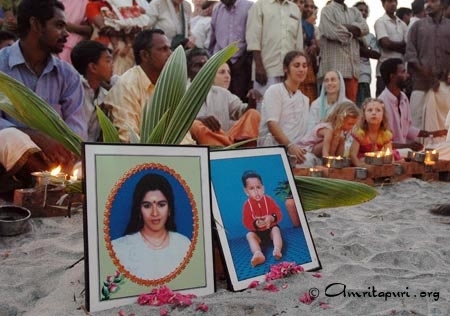 On the 28th of December, two days after the tsunami, a mass cremation was held in the village of Azhikkal, only two kilometres north of the Ashram. The ashramites helped with everything from the building of the funeral pyres, to bringing food and water for the families, to transporting the families to and from the cremation site, to consoling those who had lost their near and dear ones, to assisting them in performing the last rites. The government arranged for the firewood and the plantain trees for the ritual. All this was done by the collector. We used four of our ambulances to transport the dead bodies from the mortuary to the cremation ground. Government buses and vehicles from other service organization were also there. The cremation process went off smoothly. 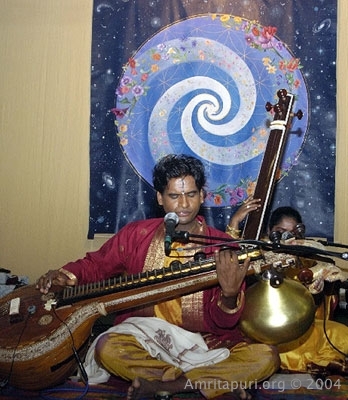 Ashram brahmacharis and brahmacharinis chanted the eighth chapter of the Bhagavad-Gita. It was such a solemn affair. People were full of pain and shock. 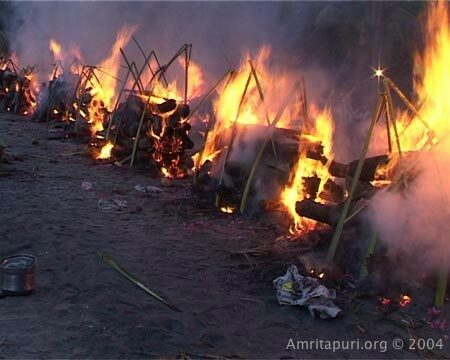 It was a rare and sorrowful sight to see 40 bodies being cremated at the same time. But nothing could compare with the sight of five mothers rushing forward to claim the body of a small child—each one thinking him to be their own. When the pyres were lit, Amma was holding a prayer back at the university campus, with all Her children sitting around Her. She asked everyone to pray for peace—both for the dead and for the living. For more then 15 minutes She sang a version of the peace mantra: lokah samastah sukhino bhavantu… This is the same song Amma had song twice the week before the disaster, each time ending in tears. 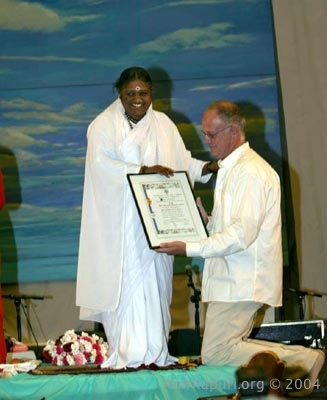 When the song was over, Amma got up and returned to the Ashram. 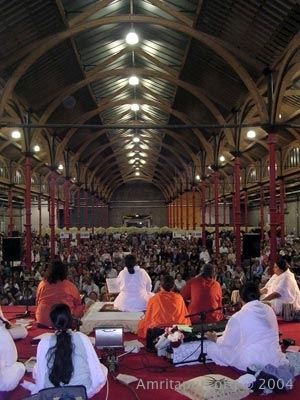 The morning of the 29th found the ashramites engaged in cleaning the Ashram. Everything was a mess: water and sludge in the ground-floor rooms; Books, CDs and tapes from the bookstall and papers from the press were scattered everywhere. Metal plates, chairs, tables and cooking vessels were strewn about… Everything had to be accounted for and cleaned. In the evening, Amma came down to see the surroundings. 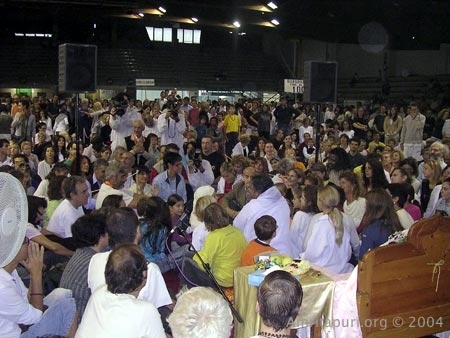 What was the condition of the Ashram? 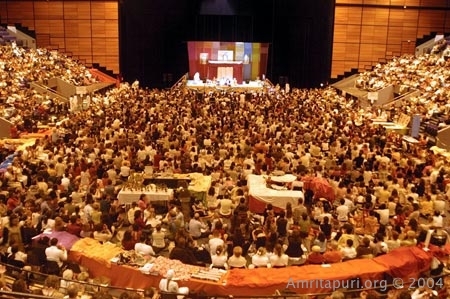 Was it hygienically safe to bring all the devotees back to the Ashram from the relief camp? Amma had to consider all these things before making a decision. 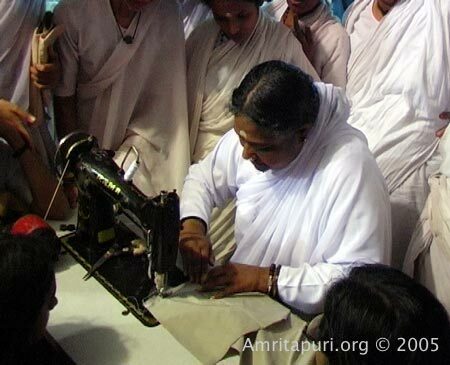 Later that night, Amma saw the brahmacharinis had set up their sewing machines in the main temple and were busy stitching underskirts for the villagers. Amma joined with them, spending an hour sewing a skirt Herself. Amma is very much concerned about the future of the villagers. Soon the Christmas vacation will be over, and the classes will have to start again at the government schools. Where will these people go? Amma wonders. What about these peoples’ clothes, cooking vessels and utensils? School books for the children? Amma is discussing all these matters with different authorities and is getting reports on everything that is required before acting. She is concerned about possible diseases that could come, epidemics. Amma has been discussing such things with doctors at Amrita Hospital. She also says that She would like there to be a study to see if another such earthquake could happen again. How can the houses be built in a way to withstand the power of the natural forces? As I write I feel a bit sad because it is impossible to do justice to all that Amma is doing by writing just one small article. And here I am only focusing on this small coastal area. Amma has also initiated similar programmes in Chennai, Pondicherry, Velankanni, Trivandrum and Vypin—sending teams of medical doctors, distributing food, clothing and toiletries. Ashram lorries and tractor trucks are helping in the removal of the debris. Ashram is providing fuel for not only our own earthmovers but also those of other organisations. 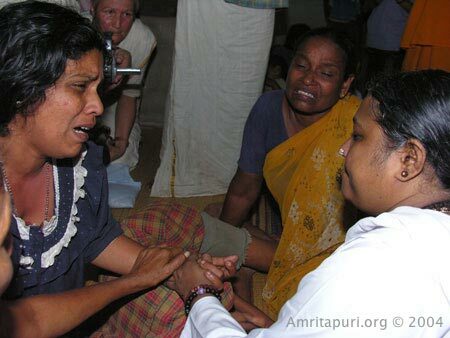 One night in Her room at the relief camp, Amma said to me, “The plight of the village is so sad. These people have lost their houses, their utensils; their children no longer have clothes or books for school. To remove their broken houses itself is difficult. It will cost almost as much to remove the debris of the ruined houses as it will to build new ones. It is a great relief that the government is there to look after these people. 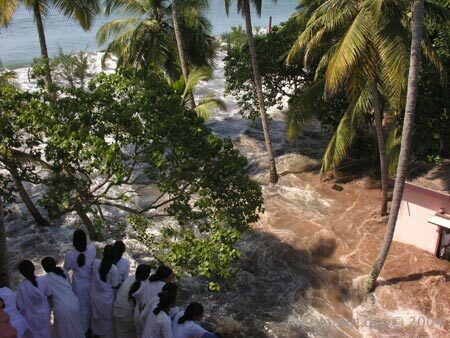 This is the first time in 52 years that Amma has seen the water coming high onto the land like this. We should pray for everyone’s peace. Pray that people are freed from their sorrow. Pray for peace. 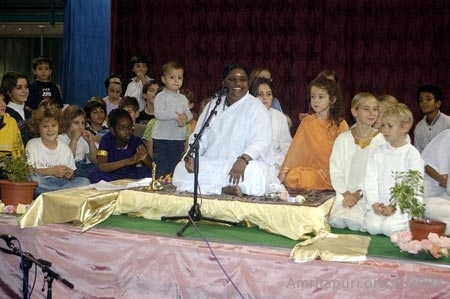 Listening to these words directly from Amma’s lips, I was stunned. I could not move. I started crying, thinking of the love and motherly concern Amma has for the world. 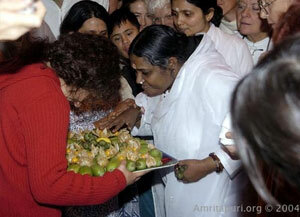 For the past five days, Amma and the ashramites have been working tirelessly. Even at 3:00 in the morning, if one walks around the relief camp, they will see people cutting vegetables, cooking rice, doctors returning from rounds, brahmacharinis sorting clothing donations… It’s important to remember that we were also affected by this tragedy. 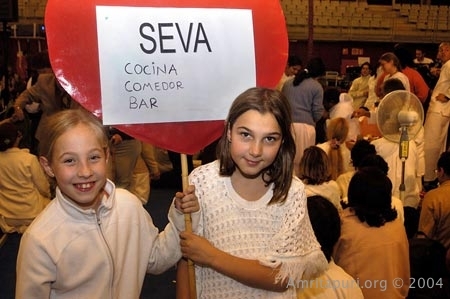 We also were evacuees. Water destroyed many of our computers, the UPS, the printing press, the books and papers kept on the first floor of the Ashram were all lost. 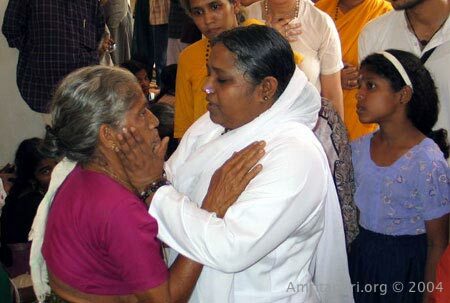 But in the midst of the sorrow and the shock of the tsunami, the presence of Amma inspired us ashramites to forget how we were personally being affected and made us ready to help others. Isn’t that the ultimate aim of spirituality? The danger is over. But the damage has been done. While no one at the Ashram was injured, the villagers have suffered great losses. Family members are dead and missing. Many of their houses and huts have simply been washed away. Amma visited the relief camps and consoled the evacuees and the families of the deceased. 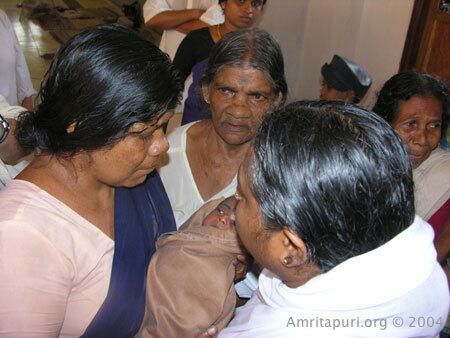 * Amma visited the relief camps, consoling the evacuees. * The government has ordered the penninsula evacuated for the next 48 hours. 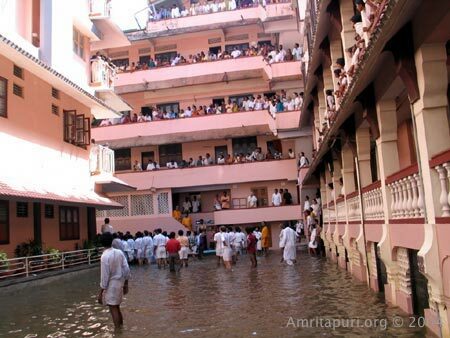 * Ashram is housing some 3,000 evacuees at the Ayurveda School and Engineering College. 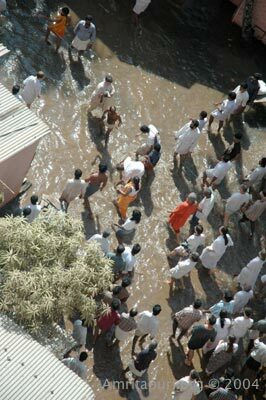 * Food, sleeping mats, water, milk and food are being provided to all by the Ashram. * The Ashram is also supplying food to all nine relief centres set up in schools by the government. * Six AIMS ambulances with 10 doctor led medical teams are visiting the relief centres every two hours. 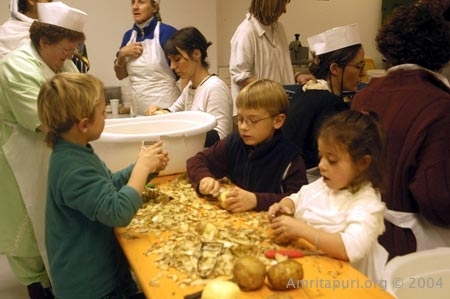 * The Ashramites are preparing food for more than 10,000 people, three times a day. 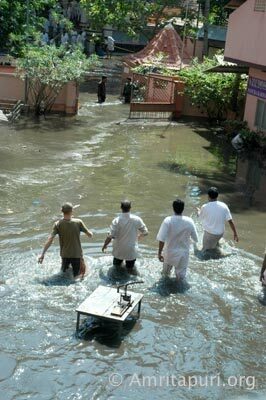 * The Ashram is also actively involved in relief operations in Cochin (Vaippin), Trivandrum, Chennai and Pondicherry. 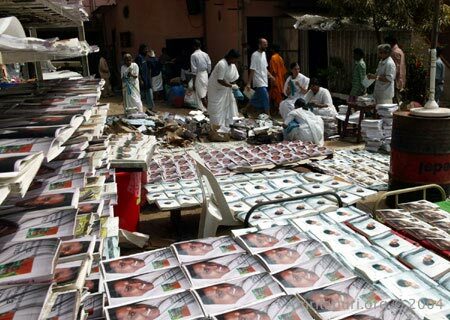 Amma has told all the Ashram branches throughout South India to help in the relief efforts. * The elephants and the cows have been moved further inland, across the backwaters. 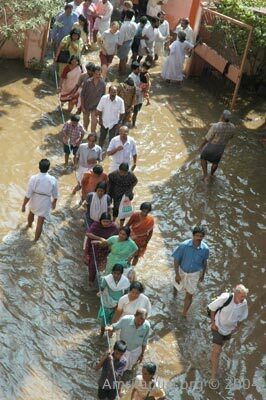 * Amma also crossed the backwaters to inquire about the welfare of all those who are staying on the University campus. She is also spending the night there. 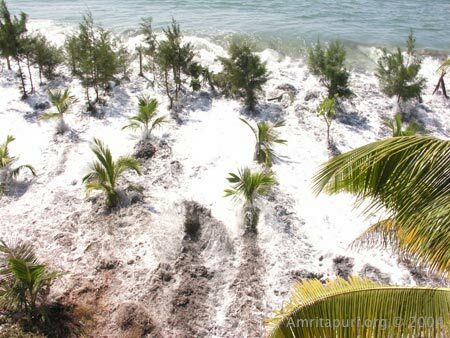 Due to the earthquake in Jakartha, Indonesia tremours occurred in many places in India, and waves were sent towards the Indian coast. 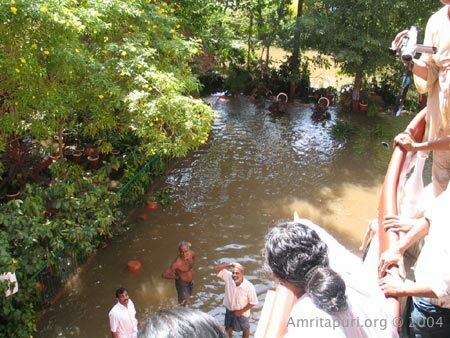 Amritapuri has been affected by tsunami waves, but no one there was hurt. 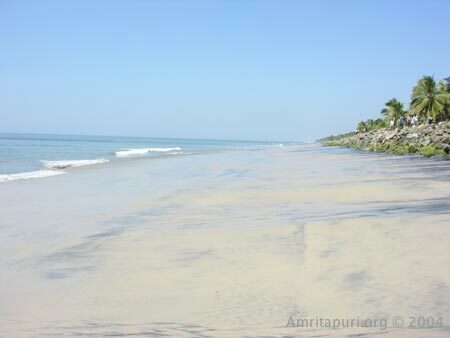 Here in the picture, the sea water is just coming to the premises of the Amrita Ayurvedic Research Centre, located on the beach. The sea level rose suddenly. 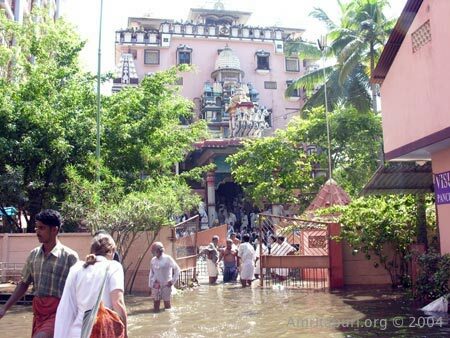 and Amritapuri was flooded. 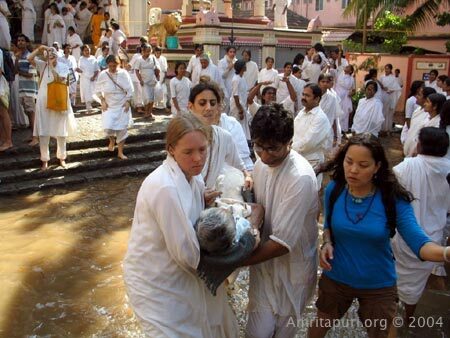 Amma was giving darshan when the water came. 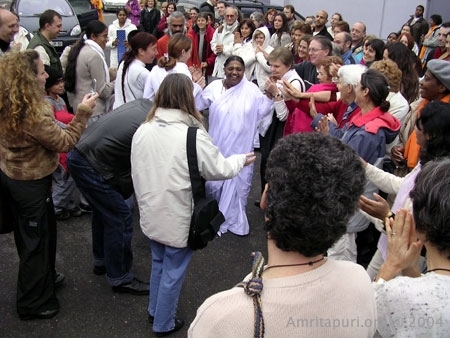 Amma made announcements over the mic, which were translated in different languages, asking all the devotees to go up the 18-story flat building. All the vehicles were asked to move from the beach. 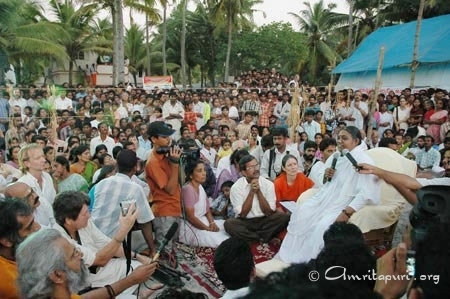 Some people went to the sea to watch after the first wave, but Amma made everyone come back to the Ashram immediately. 20 minutes later, the sea level rose again about three meters above the surface. 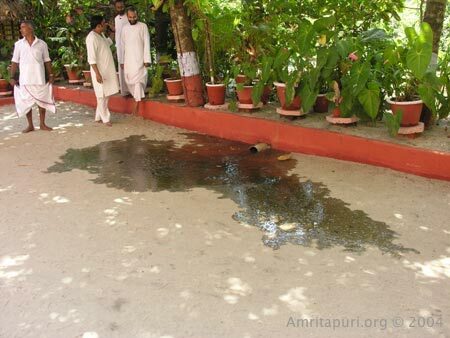 Water started gushing into the Ashram. 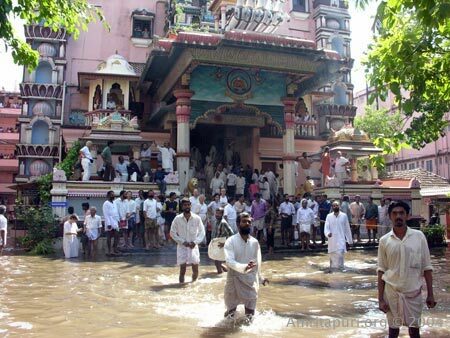 Amma had stopped giving darshan and lead the Ashramites in the rescue and relief operations. 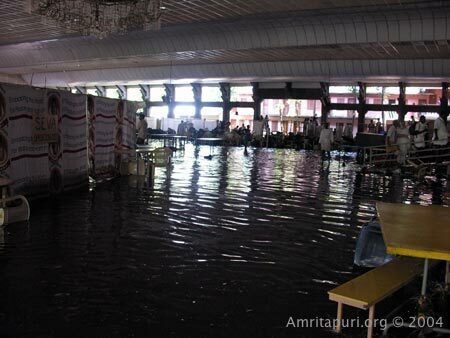 The ground-floor rooms of the Ashram were under water for 20 minutes. 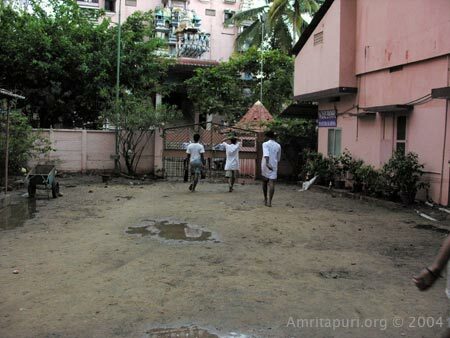 The villagers in the neighbourhood were immediately shifted to the Ashram building. 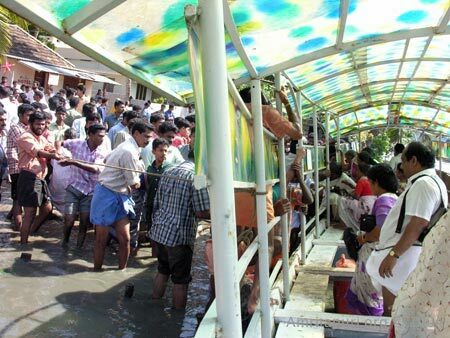 Arrangements were made for the boats to take people further inland, across the backwaters. 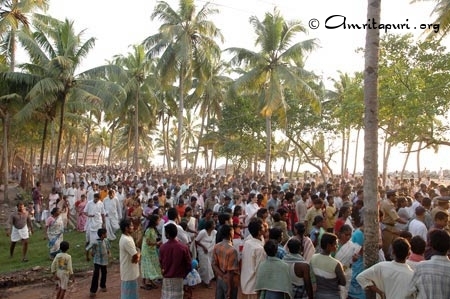 Amma sent villagers, then the devotees, then the ashramites to the other side of the backwaters. 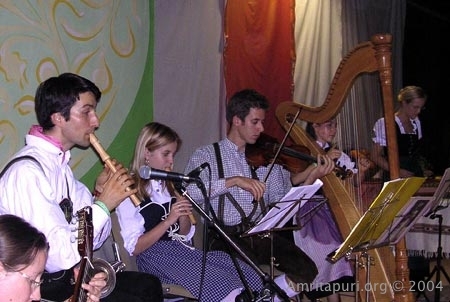 They were accomodated at the Amrita University campus. 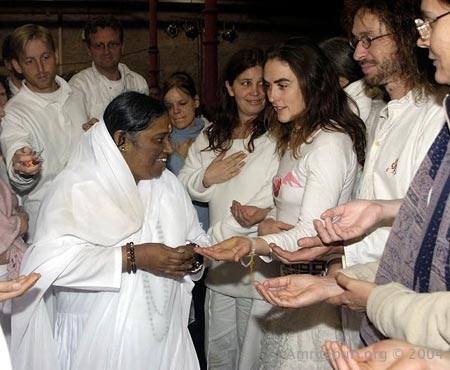 Food and basic necessities are being provided for all.The telephone and electricity are all disconnected at the Ashram.Amma cancelled Devi Bhava. 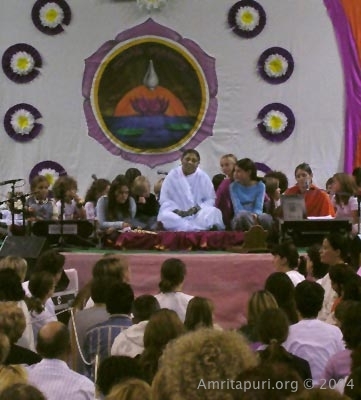 There were over 10,000 visitors including 1,000 foreigners, and 3,000 ashramites at the Ashram at the time. All are now safe in the University campus. 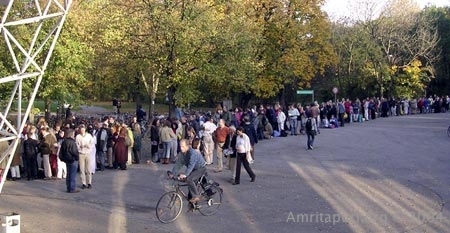 No one staying inside the ashram was hurt. 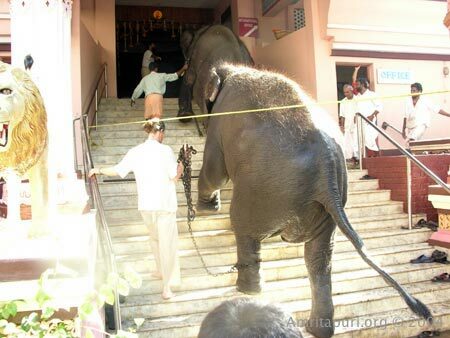 The elephants Ram and Lakshmi, as well as the cows of the ashram were moved to the top of the temple hall. And have since been relocated to the mainland. Some villagers of the neighbouring houses died in the flood. 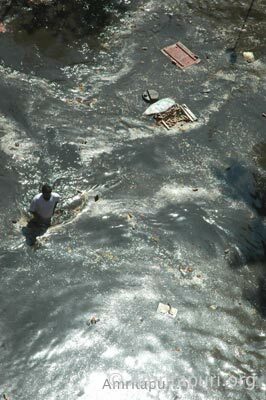 Some 150 people in Kollam District have died. 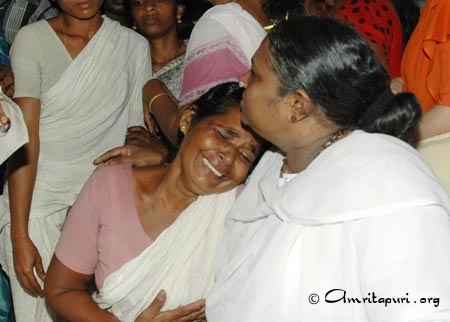 Amma said She is sad about the deaths, but She is even more sad thinking about the pain of the relatives who are still living. She asked every one to pray for the well-being of all people. 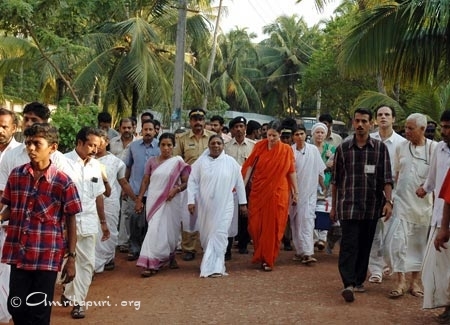 Amma is staying back at the Ashram with few ashramites. 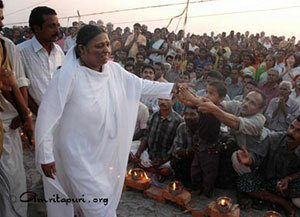 The Ashram’s University campus is providing refuge for all the devotees and the nearby villagers. Nine relief camps have also been established in the surrounding area. Amma has provided food for thousands as well as straw mats for sleeping. Not much damage has been sustained by the Ashram property. 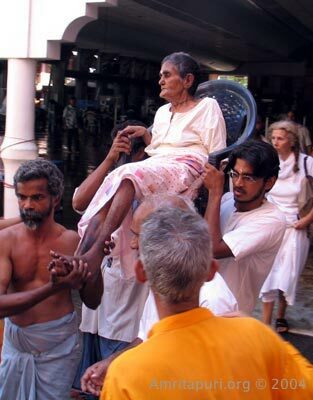 When the sea water came in… Amma started the rescue and relief operations right away. Relief camps were setup at the Amrita University campus and started serving food and water.